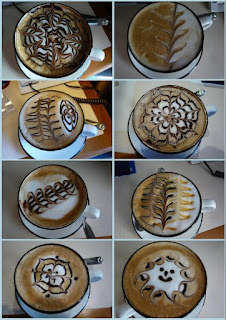 Home only 2 days and I am missing my cappuccinos! Thank you to Lievieu (sp?) for all the lovely patterns you made for me. Just delightful! Look at that little sun! How could that not brighten your day! Hopefully, you'll share some of your vacation photos with us. so glad you left this link on my blog today! OMG these are just too beautiful to drink!